Ham! It's delicious. I can't get enough of the stuff. And like millions of honest, hard-working Americans, I depend on our nation's trucking industry to bring it to me in bulk every day. But sometimes that process goes horribly awry, leaving tons of ham dumped on the freeway like yesterday's trash. 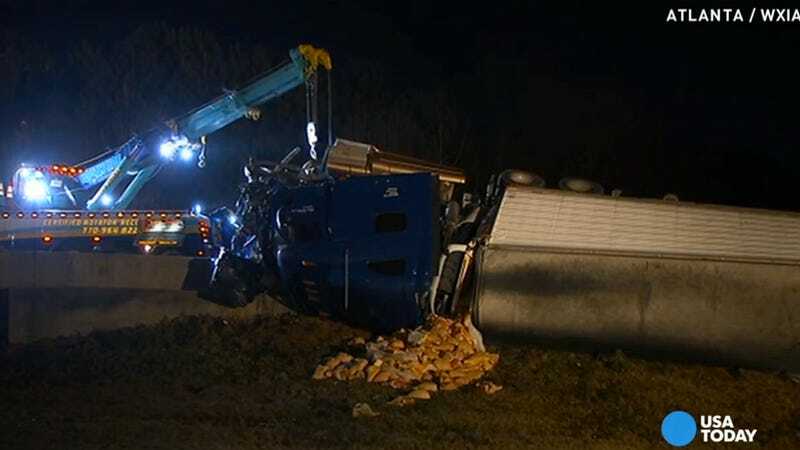 That's exactly what happened in Atlanta early Thursday morning when a semi truck carrying 40,000 pounds of ham crashed and overturned on the way to Interstate 85, according to the Atlanta Journal-Constitution. In addition to the ham, a ton of diesel fuel also spilled onto the roadway. Talk about a ham jam! "I didn't see no signs that there was a curve," said truck driver Riva Vargas. "Going 40 mph and trying to find the turnoff to 85 and when I saw the arrows, I tried to brake." Vargas said he was hauling the pork to Texas when he wrecked. "I'm okay," he said. "I just banged my head against the door when it flipped over and kind of cut it." America's ham industry will reportedly recover and emerge from this nightmare stronger than ever.